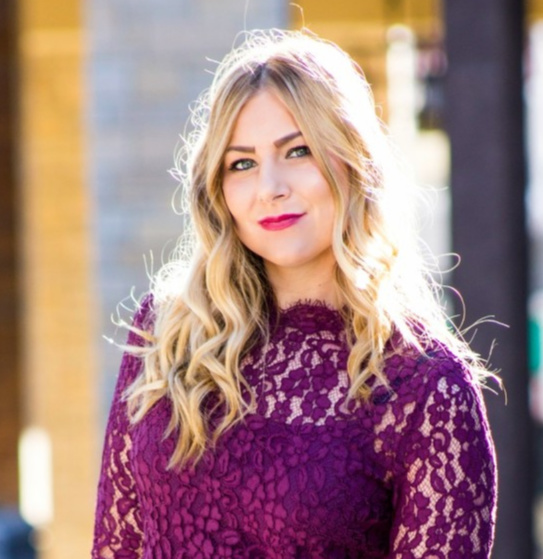 Today I’m excited to share with you a curling tutorial – I wear my hair in loose waves or curls a lot and have been using a curling wand for the past four years. 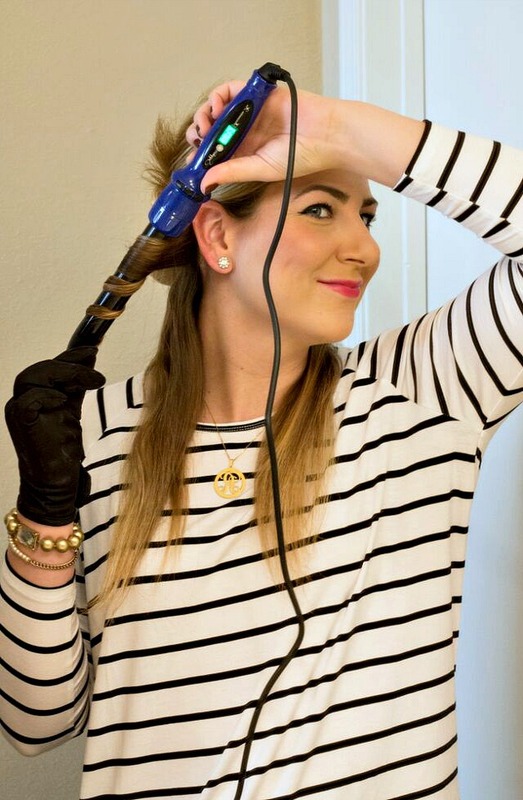 I was so excited to try out the Sapphire 8 in 1 Curling Wand from Irresistible Me and share my experience with you. 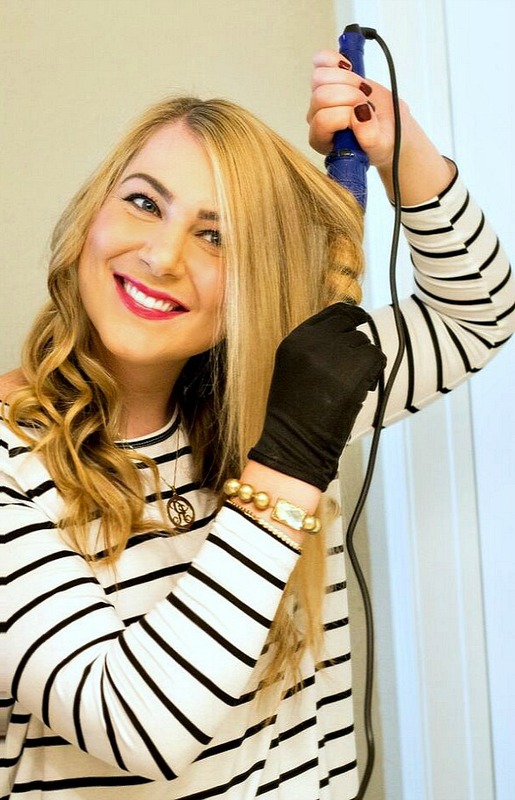 The Sapphire 8 in 1 Curling Wand is named so because of the 8 different curling attachments available with it. 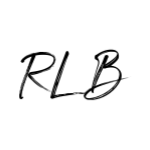 I am excited to try out a few new attachment styles that I’ve never tried before, and stick to some that I know well. 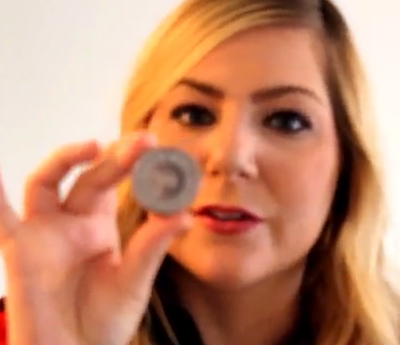 In today’s hair curling tutorial, I am using the 25 mm wand attachment. For me, it provides a more natural-looking wave look that I like. The other attachments include the 13 mm, 19 mm, 32 mm, 13/25 mm, 25/13 mm, 18/9 mm and the Pearl (which would be a great wand for beginners – shows you exactly where to loop your hair). 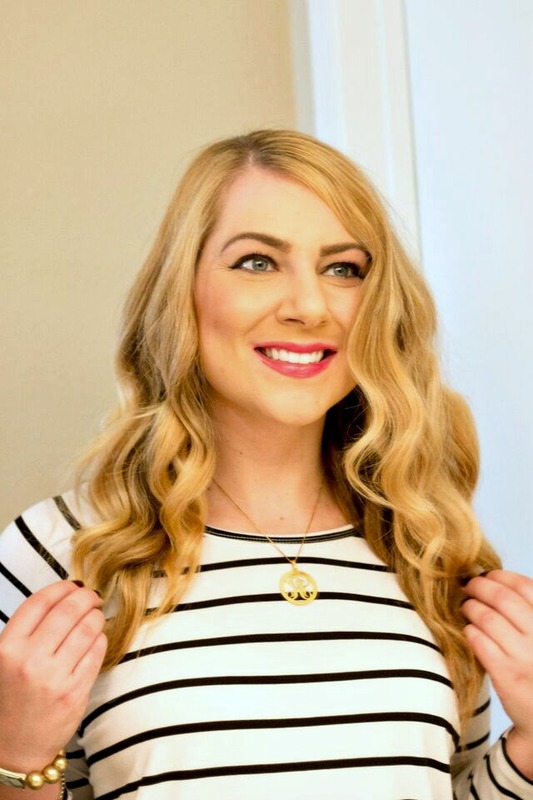 I have used a 25/13 mm wand before and my curls turned out really nicely, you can see it in these photos from my Kansas City post (my little sister has this size of curling wand). When I’m starting out, I blow dry my hair and use a hair detangler and protectant spray, styling mousse, and oil on the ends of my hair. For the actual curling part, I just need my curling wand, a hair tie and a brush. I always curl my hair in 3 sections. Depending on the thickness of your hair, you might only need to curl in two sections, but I have thick hair, and a lot of it! I start on the bottom section – and take about 2 inch sections and wrap the hair around the wand pointing down. This will help you achieve the wave look! Do it in opposite directions for each piece of hair though – this helps it look more natural. Also – don’t worry about it being perfect – I actually like to mix up the size of hair pieces I curl to give it a more messy look. I slowly let go of each curl and pull down on it. This again will help with a more natural look! (Also, what is this face? I have no idea. My boyfriend was taking pictures of this process and I can’t believe some of the faces I make while curling my hair haha). Onto the second section of hair! Repeat the same process as before. Back and forth on curling out and in, as well as some variation in the size of pieces of hair. That’s my I’m so excited I’m almost done curling my hair! I forgot to mention the curling wand also comes with a glove. If you have not used a wand before, PLEASE use it. I have burnt myself badly before not using one. Maybe I’m careless, but it is just a good idea. Repeating the same processes as before, finish the last section of hair. Again, I pull down on all the curls after I let them fall. To finalize the look, I lightly use a brush to pull out the curls a little bit, use my fingers to run through it, and shake my head upside down for a couple seconds. I also add just a bit more oil to the tips, so that the ends look nice! The finished look! I love using a curling wand because my curls last for at least two full days without any touch ups. Of course, sometimes I decide to touch up my curls, but these curls lasted for two days (see them in this outfit post too). I am hoping to do a few more looks with the various wands I’ve received and doing more hair tutorials in the future. In general for looser waves wigs, use the larger wands, for tighter, more spiral-like curls, use the smaller wands. 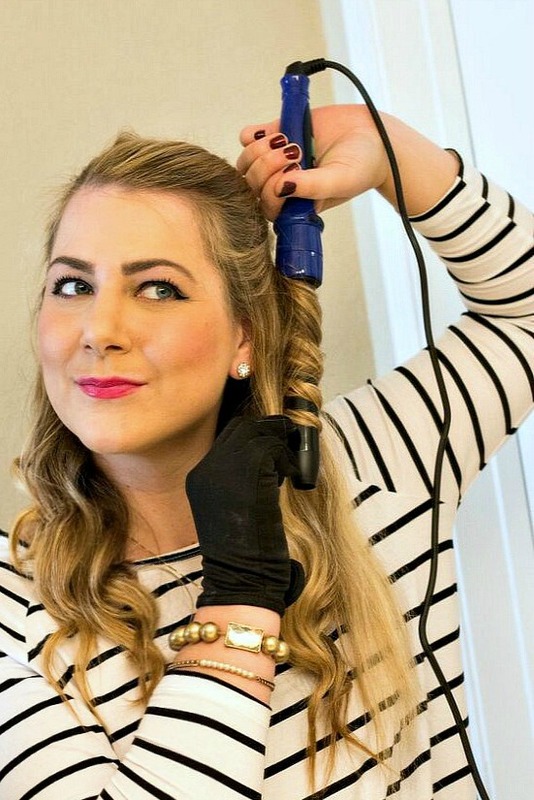 For a variety, you could also use the bigger wand to curl sections and then use the smaller ones to curl some of the sections that frame your face. I’ve done that before and it turns out well! I know this is a pretty standard/easy hair curling tutorial, so let me know if you have any hair questions or tutorials you would be interested in specifically! 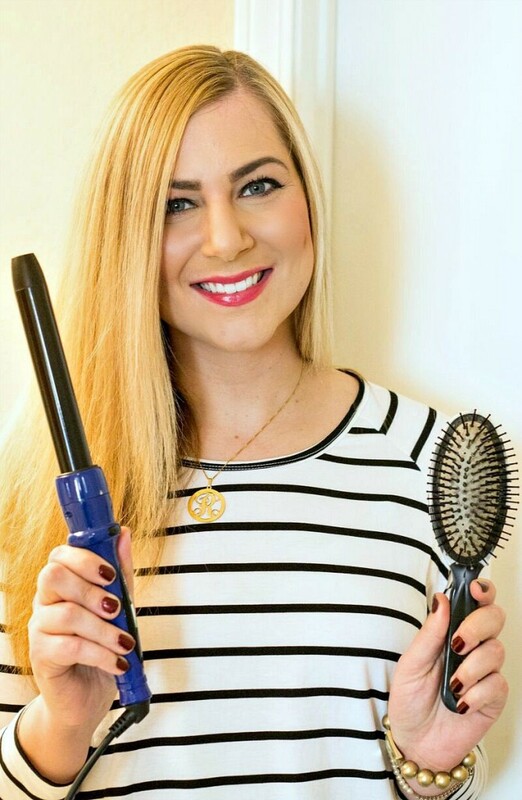 If you want to learn more about the Sapphire 8 in 1 Curling Wand from Irresistible Me, check out their website – where you can find out more specs, details, and reviews from other bloggers and customers. Your hair looks great! I love all the different attachments. That is so handy. 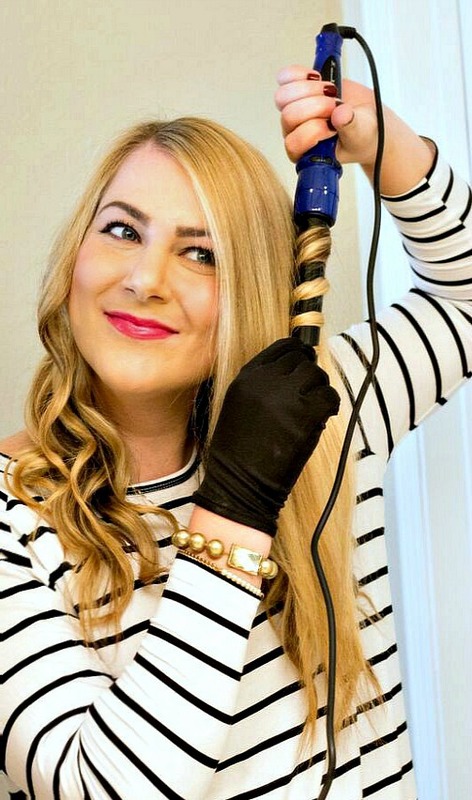 What a sweet curling wand! The finished product is gorgeous, lady! I love how it comes in 8 different attachments. 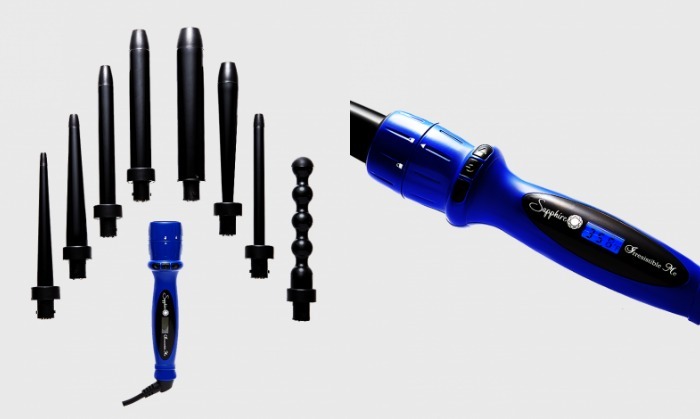 It makes it easier to create several different curls and texture without buying multiple rods! Your hair looks great Rachel! Love it! My want that I've used forever just broke..I'll have to look in to this one! 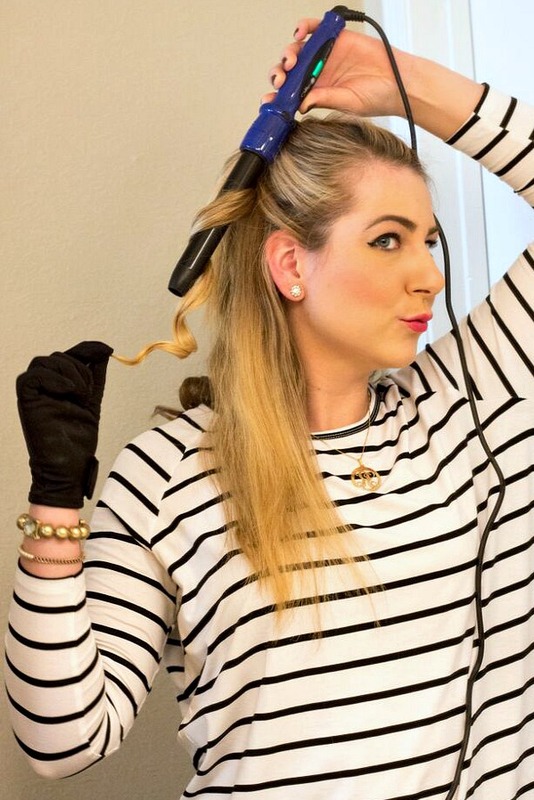 This curler looks amazing! I have one that has 4 wands but this is incredible. I love how fast you can curl your hair! I wish the curler was a different color though..just being picky 🙂 Love how your curls came out. Oh man, yes, it would be nice if it came in other colors as well! I just got one too and love how easy it is to use and how well my curls held up. Looks like a great wand and I love your hair! Great tutorial. Your curls turned out beautiful! I love how interchangeable the wands are. So many options! I love your tutorial and your hair looks amazing. I will definitely try this during the holiday season.